I don't think the message has gotten through that IT IS SPRING. IT IS APRIL. No more SNOW! Yesterday, I drove to work in a snowstorm. Yuk. And right now it is 27 degrees and is predicted to be in the 20s and 30s for the next few days. That being said, I thought a "quilted" card would help us feel a bit warmer. Fold a 5 1/2" x 8 1/2" piece of Blackberry Bliss cardstock in half, creasing well with a bone folder. Run a 4" x 4" piece of Hello Honey cardstock through the Big Shot inside the Boho Chic Embossing Folder. Use the Corner Rounder Punch to round all four corners. Using a rule and pencil, lightly mark the center of the piece. Punch one square from each of four designs of chosen Designer Series Papers with the 1 3/8" Square Punch. Carefully snip each square in half, cutting from opposite corners. With the Corner Rounder, round the corners of each of the 90 degree angles. Refer to the placement of the quilt pieces in this sample. Start your pinwheel quilt by placing one of the pointed corners onto the center pencil mark. Continue in either direction by placing in a pattern order each of the pieces so all the rounded corners are tumbling the same way. Leave a small space between each placement. Tie a length of Old Olive Baker's Twine through the holes of your chosen button. Attach the button to the center of the quilt with a Glue Dot. 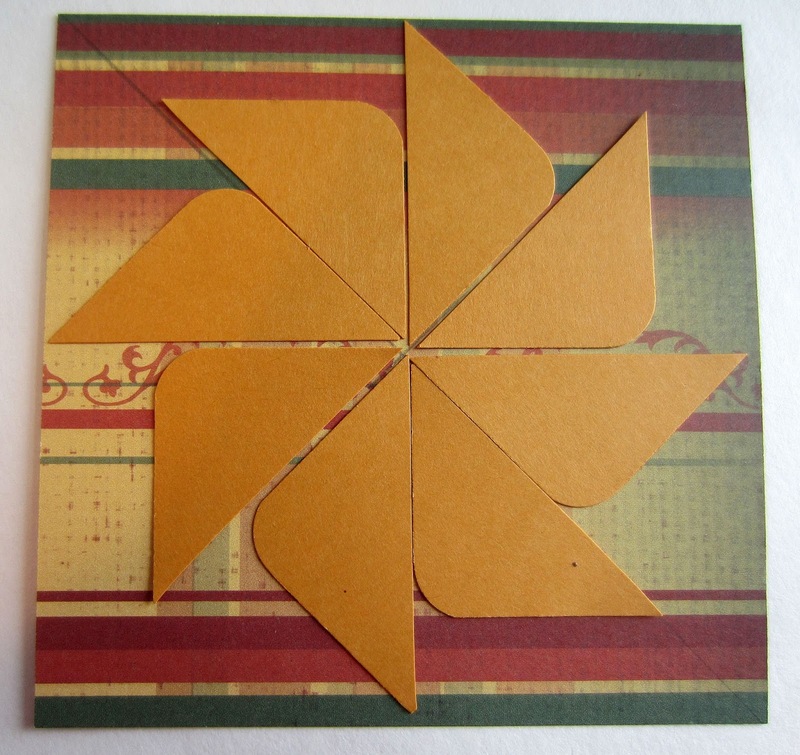 Adhere this to the card base, leaving an even border at the top and the sides. Cut a label from Whisper White cardstock using the appropriate Chalk Talk Framelits die. Adhere a 1/4" x 3 1/4" strip of DSP that matches one of the papers used in the quilt to the bottom of the label, trimming off any excess. In Blackberry Bliss ink, stamp sentiment above the DSP strip. Tie a small bow from Old Olive Baker's Twine and attach it to the upper right corner of the label. 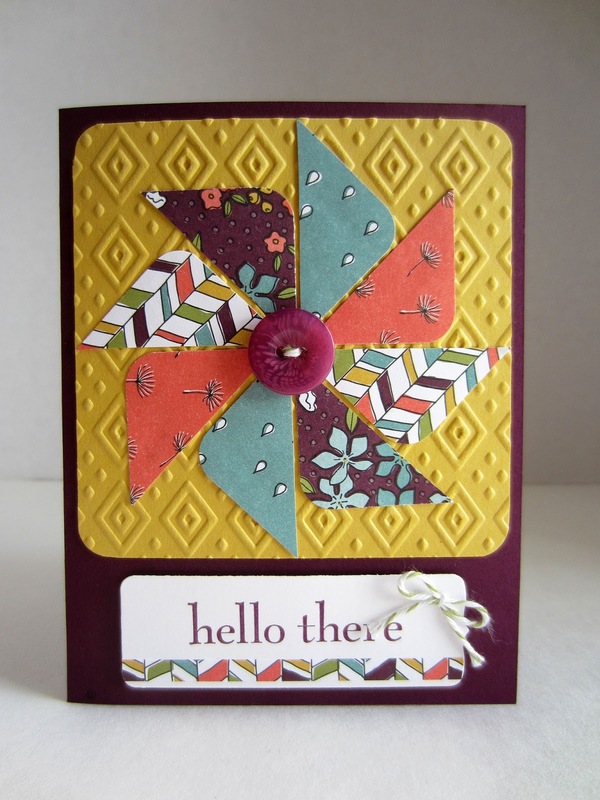 Use two Stampin' Dimensionals to attach the label to the bottom of the card. ANOTHER OPTION: If you want a truly quilted look, don't emboss the piece until all the quilt pieces are in place. Then, run the entire piece through the embossing folder, thus "quilting" everything. *PLEASE NOTE: Two of the colors I have used in this project, Blackberry Bliss and Hello Honey, will be retiring at the end of May. If you want either of these colors in any of the products Stampin' Up! offers, or any of the other three soon-to-retire In Colors, quick! Order them before they run out! The other retiring In Colors are Mossy Meadow, Lost Lagoon and Tangelo Twist. Don't forget to name me as your demonstrator when ordering! That is so cute and not too hard to make either. So pretty and creative - I wish I could make cards like this!!!!! Your cards are always so pretty and I hear ya about the snow. Enough is enough with winter. Thanks for sharing multiple links with us again this week at Celebrate Your Story. Have a fun and productive week! What a wonderful idea! Combining quilting and card making, two of my favorites. This is just so pretty!! Nice. Thank you for linking with us at #HomeMattersParty. We would love to have you again next week. This reminds me of a quilt my Mom would have made!! pretty!! Thanks for sharing on My 2 Favorite Things on Thursday! Hope to see you tomorrow!! Pinned! Thanks for sharing over at the DIY Crush Craft Party. What a great looking card! We've added this to our Pinterest board. Don't forget to stop by next Thursday to add your tutorials to our next DIY Crush Craft Party!